Sometimes, when you are hit by bad news, you can turn it into motivation. Whether you are feeling dumped by your voters or your main squeeze or your biggest client, it’s always a good time to focus on the important stuff that builds relationships in the long run. In our world of ad-sales, the important stuff is how well you understand your customers and how you can help them compete better by delivering perspective and solutions that will drive their sales. In ad-sales we call this “adding value” in the sales process. When you know a lot, you can get more appointments. 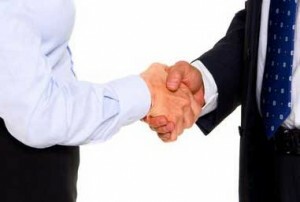 Only by getting appointments can you win more business. Only when you know a lot, can you deliver a lot. So get your nose into a book, magazine, web-site or research report about your customer’s business. Think about what inspires your advertisers prospective customers to buy, or to switch brands. If you sell cosmetics advertising, what can you learn about what inspires women to change nail polish brands or eye-liner? If you sell boat advertising, study the trigger points and needs that drive owners to purchase new engines or accessories. The more you learn about your client’s business and needs, the more interesting you’ll find your work, and the more valuable you’ll be to your clients. When you lose a piece of business or fail to win a big one, take it as inspiration to hit the books, build your knowledge, and make more calls. Or to learn the key tactics of the top media-ad-sales executives, take my Masters of Media Selling class where we focus on key tactics that will enable you to win more appointments, with higher level decision makers, persuade them more effectively, and win more closed business. 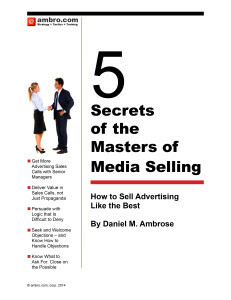 To learn about the 5 Secrets of ad-sales that separate the great from the good, download my “5 Secrets” pdf.